WHAT TIME? The Parade steps off (at Patriots Dr and East Main Rd) at 10 AM. WHERE DO I PARK? The is no designated parade parking. However there are many parking lots along the route (including the Dunkin Donuts lot just North of Patriots Dr, Clements Market and CVS). There is also parking on many of the side streets. Arrival before 9 AM is recommended. WHERE IS THE BEST PLACE TO VIEW THE PARADE. The parade route (click on the link above) is wide and clear and viewing from any point on the route will give you a good view of the parade. There will be a reviewing stand mid way up Memorial Dr where the Distinguished Participants will view the parade after they march or ride in the parade to that area. WHAT IF I AM A PARTICIPANT? 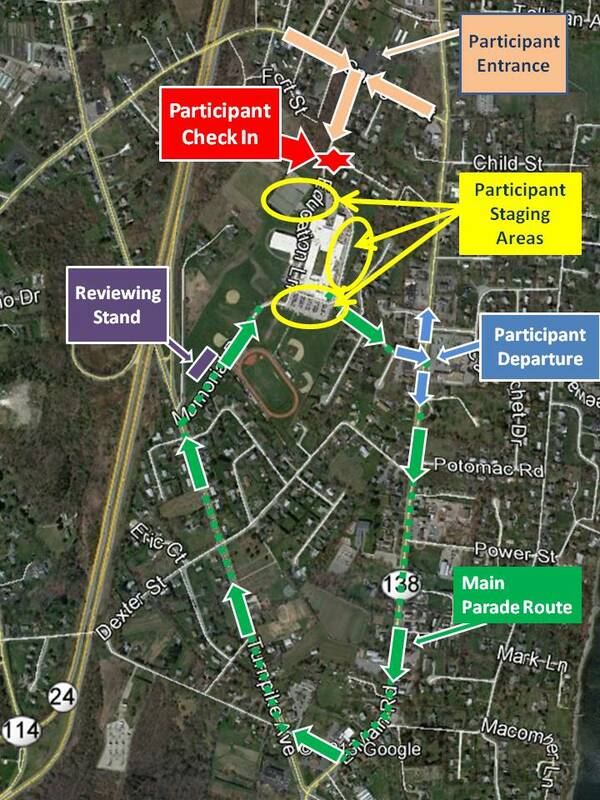 All participants must enter the staging area via Sprague St. and Education Ln. (which will be one way - North). There is some parking for vehicles transporting participants on the High School parking areas. Parade Officials (in bright yellow tee shirts) can help direct you. Exiting vehicles after drop off must exit via Patriots Dr (Which will be one way East to East Main Road). There will be a check in station at the top of Education Dr where a parade official will direct you to the proper staging area. ALL VOLUNTEERS MUST BE BRIEFED BEFORE THE DAY OF THE PARADE. Contact Sue and Fred Santos ( suem125@cox.net ) for info and to offer your help. The Portsmouth RI 375th Steering Committee cordially invites you to participate in the 375th Birthday Parade. School and line-up begins at 08:30 AM. The parade will commence at 10:00AM. Upon receipt of the application, you will be notified of your placement within the parade lineup, staging area, reporting time and disbursing instructions. If you have any questions or need further information, George Wardwell may be reached at geoedna@aol.com or 401-619-3899. GENERAL Entries should observe applicable rules and regulations or be barred from the parade. The Parade Committee reserves the right to remove from the parade, at any time, any entrant not conforming to rules and regulations or any entrant refusing to follow instructions of police or parade officials. Entries will be approved by the Parade Committee before entering the line of march. The following is a list of rules and regulations. - Performances, which stop the parade, may not be allowed. - No parade participant may be allowed to have a loaded firearm at any time. which can be read at a distance of 100 feet, and displayed in a way they can be read in high wind conditions. horse in the parade should be affiliated with and ride with an approved group. insurance should be provided with your application. PLEASE READ THESE RULES AND REQULATIONS YOU ARE RESPONSIBLE FOR YOUR ENTRY AND FOLLOWING THESE RULES The Parade Inspection Committee is checking each entry at the staging area for compliance to the rules. Entries should be in their positions by 0830 am or face elimination. Any exception to the rules will be approved by the Parade Committee. Remember that weather cannot be controlled. If at any time leading up to or on parade day the weather/street conditions are deemed unsafe, the parade may be cancelled. If cancellation is necessary, it will not be rescheduled. The use of and/or display of intoxicating beverages in the staging area or the parade is strictly prohibited. Any person violating this regulation shall be removed from the parade and/or the staging arena. All animals to be used in the parade shall be free from open cuts and shall be clean and well-groomed. Throwing of prizes, candy, food or any other material from floats or any mechanical or animal drawn vehicle that could entice spectators into the parade route is strictly prohibited. Items can be handed out only; this is a serious safety consideration. in width, and 13 feet in height from the street level. A tractor or street safe truck may pull them. - Floats and trailers should be within 6 inches in height from the street level or skirted completely to within 6 inches of the ground. - Floats with standing riders should have rails or sides no less than 3 feet high. Riders should be seated on floats without rails or sides. - Trailers transporting a car or boat may not be accepted as a parade float. vehicle for the purpose of safety. (Their job is to keep crowd and children away from vehicles.) No vehicle may be allowed to parade without the appropriate number of spotters. Absolutely no exceptions!! - Spotters should be 18 years old or older. - An ABC fire extinguisher is required to be on every float for safety reasons. - No one may get on or off a float or entry once it has started down the parade route. attached to the signed application. may be done in the staging area. You should be in your assigned spot. the parade begins. Be prepared to make necessary adjustments or your presentation may be barred from participation. - There should be at least two adults on floats where there are children. - No more than 20 people may occupy a float, depending on size.